This super hi-brightness flexible LED strip has 120 LEDS/m and connection/cutting points every 25mm. An IP65 rated waterproof version is also available with a crystal clear epoxy coating. Both types are fitted with a high quality 3M double-sided adhesive on the rear face. 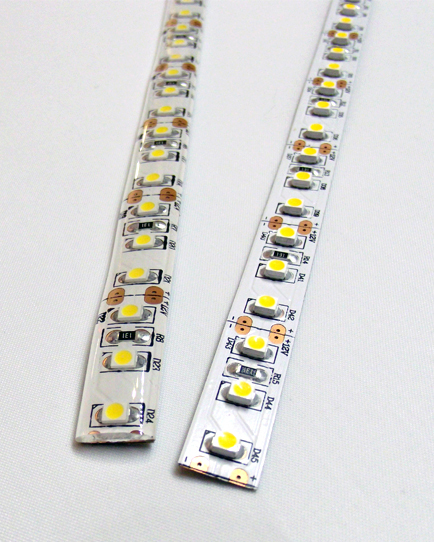 Led-Zip use a white circuit board for improved light output and enhanced appearance. The tape is supplied on 5m reels but smaller lengths can be cut to order. Led-Zip offer a connecting/cutting service, please contact the office for more details. Available from stock in COOL WHITE and WARM WHITE. Other colours available to order and as such are subject to minimum quantities.